Make traditional, simple and fun papercraft models with this easy origami book and paper kit. The ancient art of origami originated in Japan, where it is steeped in traditional values. The 20 models presented in this kit include many with strong symbolic meanings, such as the carp, the frog and the crane, which symbolize longevity, good luck and perseverance. Also included in this kit are paper models which have practical uses, such as a bag in which to store spices or powdered medications, the masu box for containing small gifts, and uniquely shaped notes with elaborate closures. The more playful side of origami is represented as well: the stylized sumo wrestler with realistic moves has entertained Japanese children for centuries, and the paper Samurai hat is a favorite of kids. Origami is an ideal activity for children since paper folding develops dexterity and creativity. Origami is also a craft based on a few fundamental 3D folding techniques. 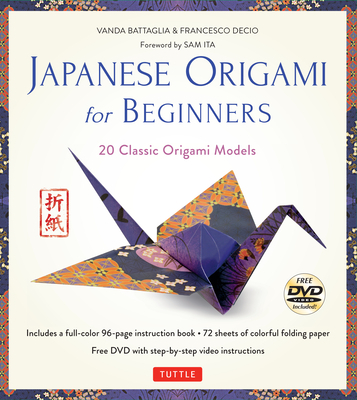 Japanese Origami for Beginners Kit is a useful starting point for fans of all ages and abilities. Although this book is aimed at origami beginners, it contains projects suitable for origami fans of all ages and abilities and is the perfect book for all those who enjoy making things with their hands.